I always love creating and sending personalized gifts-it adds another special touch! If you haven’t perused www.etsy.com, what are you waiting for? Kellie at www.pansiesposies.blogspot.com got me hooked on this site while planning for my wedding. It’s like an Ebay for sellers that customize and design their own things from invitations, pillows, stationary, jewelry, labels, etc…you can even make requests (called alchemy on etsy) and sellers will actually send you samples of what they can do and bid on your project! My friends know that I’m obsessed with it and check in daily. I have purchased my wedding sticker labels, personalized monogrammed stationery, bridal party jewelry, clutches, and much more on there so I can attest to how great they are! Today I wanted to share with you a new seller I have come across that is absolutely BUZZ worthy…meet etsy seller Noelle at “pinkbathtub designs”. 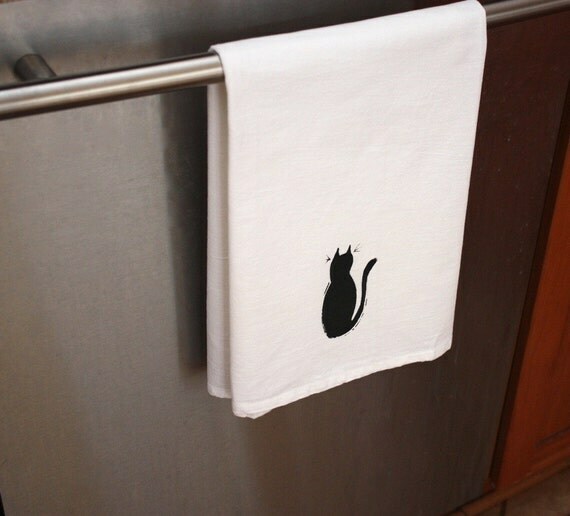 I was looking for a birthday gift for Kellie (her birthday is April 11th) and found a really cute kitchen towel with a black cat on it. Kellie has an all black cutey cat named Basil and she loves to hang out with Kellie when she’s in the kitchen. 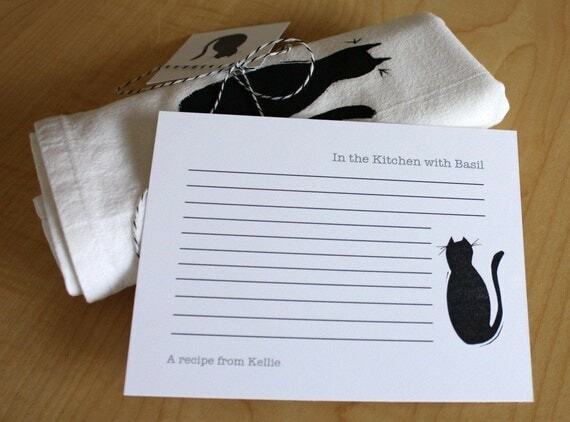 I contacted Noelle at pinkbathtubdesigns and saw that she also had a variety of recipe cards. I asked if she could make some matching cat recipe cards to accompany the towel to make a cute part of her gift. She contacted me right away and thought it was a great idea too and sent me a sample within ten minutes! We worked together on what we would put on the recipe cards for some personalized-afication and I came up with “In the Kitchen with Basil” for the top right corner and then “A recipe from Kellie”. We created, communicated and I sent payment for gift on Monday, Noelle shipped on Tuesday, and Kellie received it in the mail on Thursday and absolutely loved it! So check out pinkbathtubdesigns and sign up on www.etsy.com and share with me your great gift finds or what great things you find for yourself! Thank you so much for the post! I'm thrilled that Kellie loved the gift. I had so much fun working on these.